Oracle VPD enables you to create security policies or group policies to control database access at the row and column levels. It enables multiple users to access a single schema while preventing them from accessing data that isn't relevant to them. VPD uses fine-grained access control (FGAC) to limit data visibility to specific users. This functionality is also called row-level security (RLS). Database administrators generally leverage data access control in the application that's accessing the data. However, Oracle VPD security policies provide a mechanism for securing data at the database level itself. The ability to secure data at a granular, database object level is a very powerful feature of VPD. You attach security policies directly to the database tables, views, or synonyms. VPD enforces security to a fine level of granularity directly on these objects. It automatically adds a dynamic WHERE clause to SQL statements that are issued against a table or view, or that are synonyms of an applied VPD security policy. As a result, VPD automatically applies the policies whenever a user attempts to access data from these objects. The policy function of the object that the user is accessing returns a WHERE clause condition, and Oracle Engine modifies the statement dynamically based on the VPD predicate function. There's no way for a user to bypass a VPD security policy that has been added to an object. 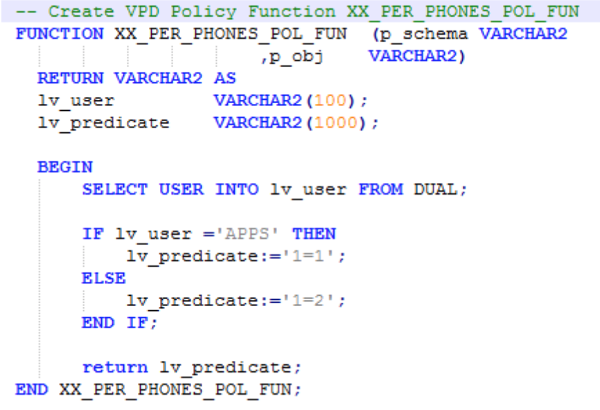 You can apply Oracle VPD policies to SELECT, INSERT, UPDATE, INDEX, and DELETE statements. 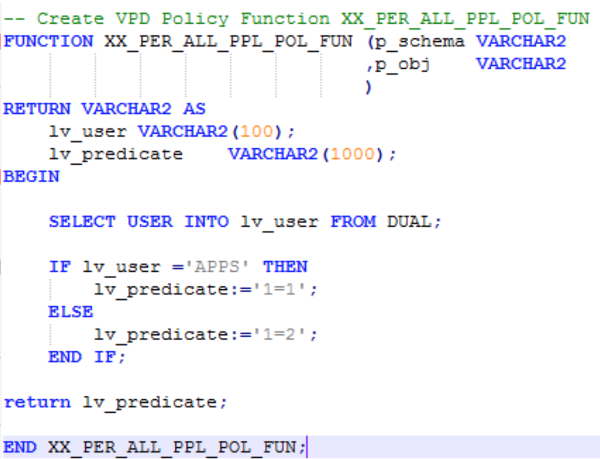 Oracle VPD policies use the DBMS_RLS package for VPD enforcement. The DBMS_RLS package contains the FGAC administrative interface, which enables you to implement VPD. The DBMS_RLS package is available only with the Enterprise Edition. Imagine that the PER_PHONES table that's used in this example belongs to your company's Human Resources department. It contains the personal phone numbers of your company's employees. You want to secure this table by adding a VPD policy to this object so that only the APPS user may view the data. This example applies VPD to the table PER_PHONES for both the APPS user and other users when they run a SELECT statement on the table. The dynamic predicate that the policy function returns causes the data to display differently. The data in the other columns should be available to all users. The sec_relevant_cols parameter enables column-level VPD, which enforces security policies when a query references a column that contains sensitive information. VPD applies to tables and views, but not to the synonyms. Specify a list of comma or space-separated valid column names of the policy-protected object. This parameter defaults to all of the user-defined columns for the object. Use the sec_relevant_cols_opt parameter with the sec_relevant_cols parameter to display all rows for column-level VPD, filtered queries (SELECT only), where sensitive columns appear as NULL. The default value for this parameter is NULL, which enables the filtering defined with sec_relevant_cols to take effect. Set the value for this parameter to dbms_rls. Use ALL_ROWS to display all rows, but with sensitive column values that are filtered by the sec_relevant_cols parameter as NULL. The APPS user can see all of the column data in the table. Other database users can't see the data in these columns because the policy function masks those fields. The examples in this post were tested on Oracle Database 12c Enterprise Edition Release 12.1.0.2.0 (64 bit). They demonstrate how VPD enables you to control access to table columns and rows by both database users and non-database users, such as application users. VPD policy groups enable you to selectively hide application table columns from different types of application users. While this functionality is powerful, keep in mind that you shouldn't add complex logic to your policy functions because it might impact performance. Learn more about Rackspace database services.